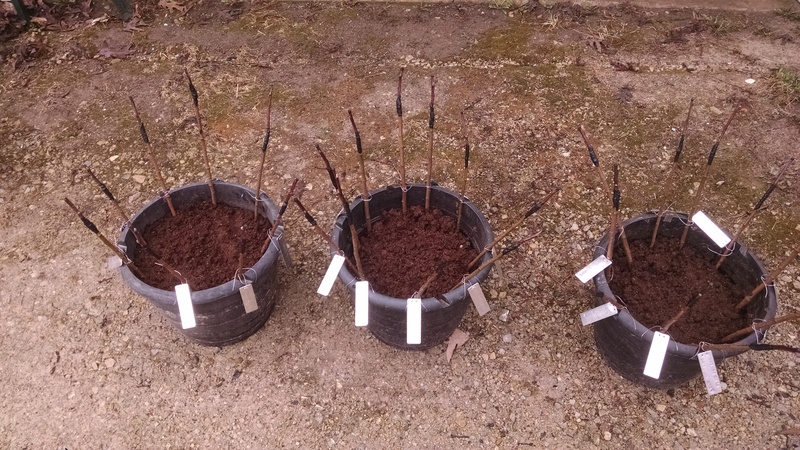 Today, I finished grafting my 50 apple trees for the spring. Last year, I grafted two. Both died. This year, I changed things up a bit: a good left-handed grafting knife and M7 root stock that looked extraordinarily robust. Of course a lot more practice may help. So what’s going in the nursery? Fresh eating apples (Malus domestica): Ashmead’s Kernel – Atlas – Black Gilliflower – Calville Blanc d’Hiver – Cox’s Orange Pippin – Delistein – Golden Nugget – Golden Precoce – Griffith – Grimes Golden – Hidden Rose – Late Strawberry – Livadiyskoye – Lodi – Northern Spy – Rome Beauty Law – Wealthy – Winter Sweet Paradise – Viking. Two wild card scions from a friend: a Thomas Jefferson and an Etzel. The first is problematic because Jefferson grew a lot of different varieties of apple trees that are still in existence (and at least one that isn’t). The second is problematic because it isn’t listed anywhere. Odds are good it is a known variety, I just don’t know enough to ID it. Nothing provides good cross-pollination better than a crab apple (Malus angustafolia). I grafted some Virginia Hewes Crab, a good cider apple which also traces its lineage to Jefferson’s estate, and Young American, which produces large fruits perfect for making jelly. My absolute favorite variety this year is Kaz 96 08 15, a Malus sieversii. Why? Because it is the apple, a scion wood from one of the apples that started it all in Kazakhstan. I don’t care what it tastes like, though I am quite curious. All Malus domestica – the apples we eat every day, buy from the grocery store, and grow in our orchards – are descendants of the wild Malus sieversii.